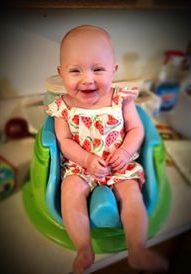 My great grand niece, Reece Victoria Renae Balcerzak is a little girl who has coma a long way is just one year. Looking back on her first year of life can take her family from the deepest fear of loss to the greatest thrill of victory. 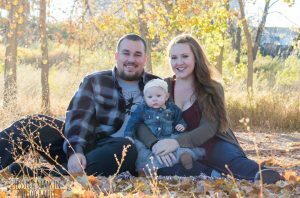 Reece was originally due February 17, 2018, but on December 1, 2017, things went wrong in a scary way. While Reece’s parents, Katie and Keifer, were sitting on the couch talking about the future and the precious little life Katie was carrying, her water broke. They rushed to the hospital, where the staff prepared them for a ride in an ambulance to the airport, and a trip on Life Flight to Denver where they were taken to Presbyterian Saint Luke’s Hospital. They had such different plans for this time in their lives. On October 5, 2017, Katie and Keifer found out that their bundle of joy was going to be a girl. They couldn’t have been more excited, and now on December 1, 2017, they couldn’t have been more scared. 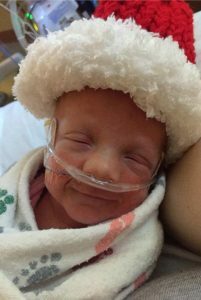 After all, Katie was just 28 weeks pregnant. Birth now was just too soon. Keifer later wrote, “Presbyterian Saint Luke’s Hospital has been an amazing place. The Doctors and Nurses are top notch and treat us like normal human beings. We have been told that they hope to keep Katie pregnant for another 5 weeks before she will be induced. However, it’s very scary because with her water being broken we all know she could begin labor at any given time. After Katie gives birth our baby girl will be here until her original birth day of February 17, 2018.” The goal of five more weeks was not to be, and on December 14, 2018, Reece made her entrance into the world. She was born at 2:23pm, weighing just 3 pounds 11 ounces. She was just 17¾ inches long. That unplanned arrival marked the traumatic start to little Reece’s life, but her story did not end there. Reece received amazing care at Presbyterian Saint Luke’s Hospital. The are like God’s miracle working network for babies, preemie or just sick. A very long 60 days later, Katie and Keifer left Presbyterian Saint Luke’s Hospital, with very mixed emotions. They wanted to go home, but as any parent of a preemie will tell you, that carries with it the worry over your child. Nevertheless, before long, Reece’s sweet smiles and her darling personality soothed their worried minds, because it was obvious that their little girl was going to be just fine at home too. Reece has made amazing progress, and while she may still be a bit smaller than average, she is a happy, healthy one year old. Today is Reece’s 1st birthday. Happy birthday Reece!! Have a great day sweet girl!! We love you! !